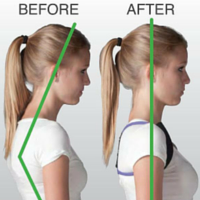 Improve your posture. Improve your health. Our bodies are negatively impacted from long periods of sitting or inactivity. In addition, most people do not maintain proper posture while using a computer, driving, watching television, walking, standing etc. Reduce the risk of joint damage. Stabilise (Wear the Posture Medic to gently remind you to maintain better posture). COMES WITH A FULLY ILLUSTRATED POSTURAL AND EXERCISE GUIDE.